Fed by data captured from the Nazis Western aircraft designers in the immediate post-WW2 period sought to see just was possible with the new jet engines and related techologies. 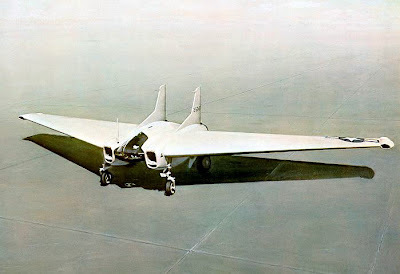 Not everything worked out though, and the Northrop XP-79 was one of them. What was wrong with it? Really it was the concept of the weapon system, the XP-79 was intended to stop enemy bombers by hitting them! The XP-79 was an interceptor developed by Northrop in WW2 initially to powered by a rocket but later 2 turbojets were substituted because of delays in developing the rocket engine. Although it was to be fitted with 4 machine guns the XP-79, which was built very strongly from a magnesium alloy with very strong wing leading edges, was intended to ram enemy bombers and slice off their tails with it's wing's leading edge! Whether this could have worked is unknown, the XP-79 only flew for around 15 minutes. On it's first flight in September 1945 the pilot, who lay in a prone position in the plane, lost control and was killed whilst trying to escape it. The project was canceled. Perhaps a reason for this was the authorities suddenly realising that ramming enemy aircraft was the act of a desperate collapsing power not the side who actually had won the war.